Patients with advanced metastatic colorectal cancer (CRC) face a very poor prognosis, including a high risk of tumor recurrence and high rates of mortality, with resistance to chemotherapy representing the most significant hurdle to survival in these patients. Improved chemotherapeutic regimens that target cancer stem cells (CSCs) or cancer-initiating cells (CICs) may improve patient outcomes, although current in vitro assessments of new drugs or drug combinations often employ commercially available cancer cell lines that may not adequately represent the in vivo scenario with regard to CIC content or functional/genetic heterogeneity [1, 2]. These obstacles led researchers from the groups of Matthew F. Kalady (Case Western Reserve University, Cleveland, Ohio, USA) and Jeremy N. Rich (University of California, San Diego, California, USA) to analyze patient CICs derived from CRC metastatic lesions as a means to mimic the clinical situation to devise better therapeutic approaches. Reporting in STEM CELLS, Jarrar et al. describe how the inhibition of a DNA critical single‐strand break repair mediator may represent an exciting means to potentiate chemotherapy  and improve outcomes in patients suffering from advanced and metastatic CRC . Initial analyses revealed that patient-derived CICs displayed elevated levels of chemoresistance (in response to standard 5-fluorouracil chemotherapeutic treatment ) when compared to their more differentiated progeny. In contrast, conventionally employed commercially-available colorectal cancer cell lines (HCT116, SW480, and SW620) failed to adequately model therapeutic resistance. Interestingly, CICs exhibited elevated levels of chemotherapy‐induced DNA break repair and critically depended on the poly‐ADP‐ribose polymerase (PARP) single‐strand break repair mediator to survive chemotherapeutic insult . 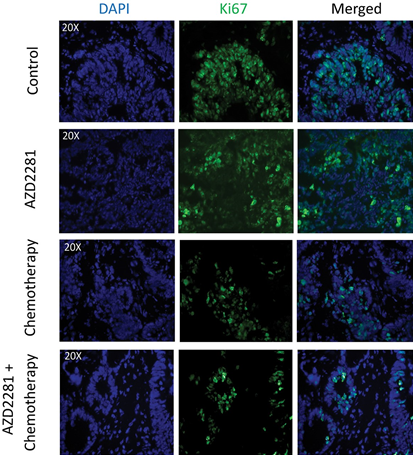 However, pretreatment with a small molecule PARP inhibitor (AZD2281) synergized with chemotherapeutic treatment to reduce CIC viability, self‐renewal, and DNA damage repair in vitro and tumor regression in vivo in a mouse CRC model. The study also noted the relevance of this combinatorial treatment in human CRC patients, as they detected elevated levels of PARP in tumors and metastases when compared to normal tissue. The authors hope that their findings will promote the application of synergistic combinations of PARP inhibitors and currently approved chemotherapeutic regimens in preclinical/clinical trials with the goal of improving the survival of patients suffering from what is the third most common cancer in the United States. For more studies hoping to take down cancer-initiating cells and develop enhanced combinatorial treatments for colorectal cancer, stay tuned to the Stem Cells Portal. Will this combination, or a similar drug duo, function safely and effectively in human CRC patients? Does PARP inhibition represent an effective pan-cancer means of chemotherapeutic sensitization? Should testing of anti-cancer therapies move from cell lines to patient samples containing CICs? Gerlinger M, Rowan AJ, Horswell S, et al., Intratumor heterogeneity and branched evolution revealed by multiregion sequencing. New England Journal of Medicine 2012;366:883-892. Gillet JP, Calcagno AM, Varma S, et al., Redefining the relevance of established cancer cell lines to the study of mechanisms of clinical anti-cancer drug resistance. Proceedings of the National Academy of Sciences 2011;108:18708-13. Venere M, Hamerlik P, Wu Q, et al., Therapeutic targeting of constitutive PARP activation compromises stem cell phenotype and survival of glioblastoma-initiating cells. Cell Death and Differentiation 2014;21:258-69. Jarrar A, Lotti F, DeVecchio J, et al., Poly(ADP-Ribose) Polymerase Inhibition Sensitizes Colorectal Cancer-Initiating Cells to Chemotherapy. STEM CELLS 2019;37:42-53. Ragnhammar P, Hafstrom L, Nygren P, et al., A systematic overview of chemotherapy effects in colorectal cancer. Acta Oncologica 2001;40:282-308. Farres J, Martin-Caballero J, Martinez C, et al., Parp-2 is required to maintain hematopoiesis following sublethal gamma-irradiation in mice. Blood 2013;122:44-54.